Chockers are the IT thing this coming season. An idea is to wear a brightly, colored chocker under button ups. The idea is to wear them underneath the collar, to replace a tie! I think that's pretty damned clever I discovered the idea from Refinery29. And I found a few chockers that I would love to have!! I think chockers, are just really great ideas to wear with simple tops with a crew cut or strapless numbers.These are definitely statement pieces that will help you stand out! + I just got spotlighted by Melanie from Those things they said, Read it here! Oh, and she's always on the look out for some amazing lovely blogs out there, so check it out, if your interested in getting featured! + I'm really excited about my Product Development class project!! Ah, haha.. I've never been so excited for a class before. And I'll write more about it another day. But so far I'm really loving this semester. + I have about maybe 2000 blog posts to read combining my google reader and bloglovin. I started looking at them on Monday.. and honestly, I was so delirious from being up from 6 am to midnight. Exhaustion! But I slept amazingly well. + Again, thank you so much for your lovely words of encouragement and comments. omg....i love the second one!!! I'm seeing a lot of great chokers in stores lately - I think it's going to b a very cool trend! I think chockers are great! I have a lovely lace chocker from Cookie Lee that I adore and used in one of my photoshoots. Congrats on being the blog of the moment! Those chockers are cool. i never really wear jewelery but these could be an exception! I love the 1st two necklaces! Congrats on the feature, how fun.. I love the last choker. I could not pull it off but it would be lovely to see. Mmm I absolutely adore the first one. I have yet to grab one for myself. Congrats on the blog feature and I'm so glad to hear you're enjoying the semester! 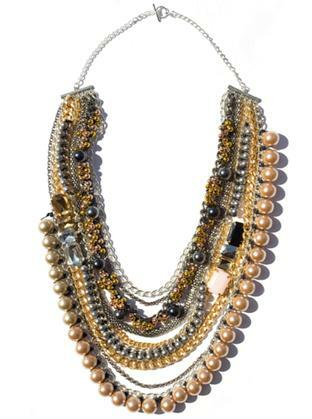 the 2nd one by intermix is just the perfect kind of junky necklace i'd want...i bet it's heavy though!haha! These are all so cute! My favorite is the 4th and 5th ones! So beautiful!! chockers are great for autumn styling! congrats for the feature! will post your guest post on Sep 4 & 6! come to check! That last one is incredible! I immediately clicked over to the shop Web site . . . and then sighed in disappointment upon discovering that they sell for $600! Lovely blog. I found you through IFB and I can tell that you have a great sense of style. Lets become fashionable blogger friends and follow each other. Check out my blog and maybe you'll have the possibility in writing a recessionista chic post. congratulations!!! you so totally deserve it. I love the first choker. really beautiful. i've never been a fan of chokers, but i love the fourth one! :) That's awesome! I like this list, haha. I totally feel ya on tooooooons of blog posts to catch up. Haha. I'm going in order from oldest to newest, and I'm just commenting on this NOW... hahaha this is what, 8 days old? AHHH..